Ochpochmak is a Tatar national dish, an essential food in Tatar culture. 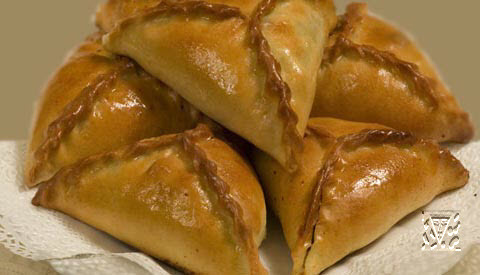 Usually, öçpoçmaq is a triangular pastry, filled with minced beef, onion and potatoes. Unleavened or leavened dough is rolled in small cakes by a size with tea saucer. On small cakes lay the prepared filling, the edges of dough raise from three parties nip, abandoning in the middle opening and giving shape to good triangle. For filling fat meat and potato cut shallow blocks and mix up with the finely chopped onions, oil, pepper and salt. Filling it is necessary to prepare not all at once, by small portions. Triangles oil by yolks with milk, put in the heated broiler, in a half hour take out, infuse into through opening clear soup and continue to be stove. Before serving up in ochpochmaks infuse into clear soup and top smear with oil. Ochpochmaks is eaten with bouillon or with tea. On 1 kg of dough : a 600-650 g of flour, 20-25 g of yeasts, 30 g of sugar, 1-1,5 eggs, 50-60 g of margarine, 100-120 g of milk, 150-200 g of water, 10-20 g of salt. On one ochpochmak: a 60-70 g of potato, 30-35 g of burnt onion, 10-25 g of the melted butter, salt, pepper. 50 g finely carved.